SSX 3 is a snowboard racing game that was first released on the Nintendo GameCube, PlayStation 2 and Xbox in 2003. The modes are Conquer the Mountain (career mode where you earn cash to unlock tracks and upgrade stats), Single Event (play any unlocked track), Shadow Racing (race against your best times / scores) and Multiplayer (head-to-head). The career mode features several challenge types such as Race which is a dash to the finish line; launching off a ramp and gaining huge air as you glide over several mountain tops is exhilarating, and I love that there's multiple routes in which to tackle the huge tracks. Likewise, there's always a perfect mixture of grind-based obstacles and ramps to suit both play-styles, and successfully managing to link them together is a thrill. The controls are solid and the ability to upgrade stats and customise your rider is fantastic. Despite some pop-in and a limited draw distance, the graphics are outstanding and the frame-rate rarely dips, even in the most intense moments. The Slopestyle challenges task you with scoring the most points before reaching the bottom; not only are these great for variety, they dramatically alter the way you play, as they force you to use every part of the environment to methodically move up the leaderboard. In the Super Pipe events, the objective is to continually launch yourself up the pipe to score points, and the awesome inclusion of air-based multipliers makes for some exciting attempts. The main gameplay flaw is the automatic grind mechanic, as you'll often find yourself sticking to an object that appears from nowhere and then heading into a less preferable path. Also, I did sporadically experience a bug where my rider clipped through the floor while continuing to rack up underground air points! 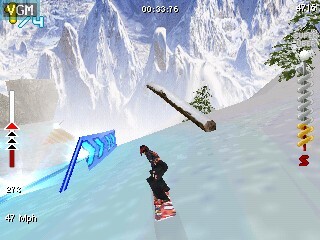 SSX 3 is a fun racing game that provides hours of entertainment while highlighting the graphical prowess of the Gizmondo handheld. Sure, it's a little unpolished in certain areas, but if you can forgive the occasional niggle you'll experience some high-quality gameplay that has plenty of challenge and variety to boot. Random trivia: The game was also ported to the Nintendo Game Boy Advance in 2003.